This extreme pressure hydraulic swivel uses our convenient stacked housing design, which allows the use of our patented floating backup rings. Hydraulic swivels provide for the communication of hydraulic fluid pressure between a shaft and a housing that are relatively rotatable with respect to one another. High-pressure hydraulic swivels face various design challenges, one of the most notable being the extrusion gap between the housing and shaft. Kalsi Engineering provides robust solutions for high-pressure hydraulic swivels. One example is our simple stacking housing arrangement that accommodates our patented floating backup rings, combined with high-pressure swivel seals that use hydraulic fluid to lubricate the dynamic sealing interface. This page highlights this improved hydraulic swivel design for use with Kalsi-brand high-pressure hydraulic seals. High-pressure hydraulic swivel seal performance depends on several swivel design factors. One of the most crucial factors is the radial extrusion gap clearance between the swivel housing and the shaft. For the best performance, this extrusion gap must be as small as possible without risking heavily loaded housing-to-shaft contact. Too large of a gap will result in accelerated extrusion damage, reducing the life of the seal. If the extrusion gap is too small, potentially heavy contact between the housing and shaft may produce high friction, resulting in heat and damage to the shaft, housing, and seals, causing the swivel to fail. Kalsi Engineering provides a solution with a high-pressure swivel design that uses a simple stacking housing arrangement to accommodate our patented floating backup rings. These novel backup rings are provided with hydraulic force balance in the axial direction, which allows them to float laterally to follow any shaft runout that may be present. This allows them to minimize the clearance at the extrusion gap while avoiding the damaging risks of heavy contact, maximizing performance. The expandable drawings included below show some of the construction details of hydraulic swivels for extreme high-pressure service, explaining design decisions, and their importance to the functionality of the swivel. 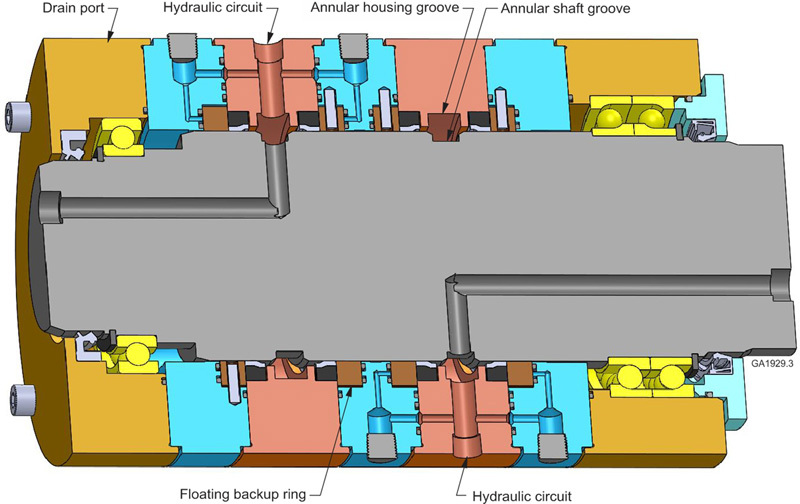 The leftmost image below shows the overall construction details of a hydraulic swivel. 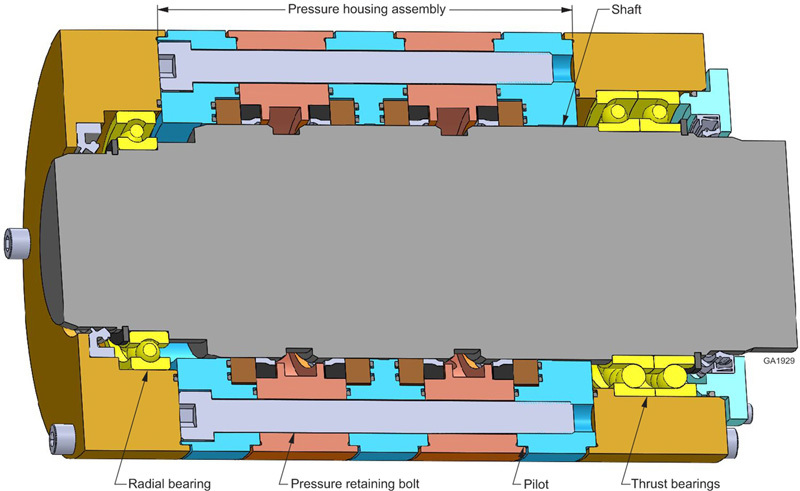 The pressure housing assembly consists of a stack of housings that are retained together by a pattern of bolts. The bearings are contained within housings that are bolted to opposite ends of the pressure housing assembly. One of the most common challenges high-pressure swivel seals are exposed to is component pressure breathing, where hydraulic pressure causes components to change dimensions. In conventional swivel designs, this alters critical clearances, which increases the demand on the seals. In the depicted hydraulic swivel design, pressure breathing of the housings due to the internal hydraulic fluid pressure does not affect the extrusion gap clearance. This is because the patented floating backup rings are radially pressure balanced, and separate from the pressure housing assembly. The placement of the bearings in separate, unpressurized housings helps to maintain the fit of the bearings, which in turn minimizes shaft runout and related damage to the swivel seals. 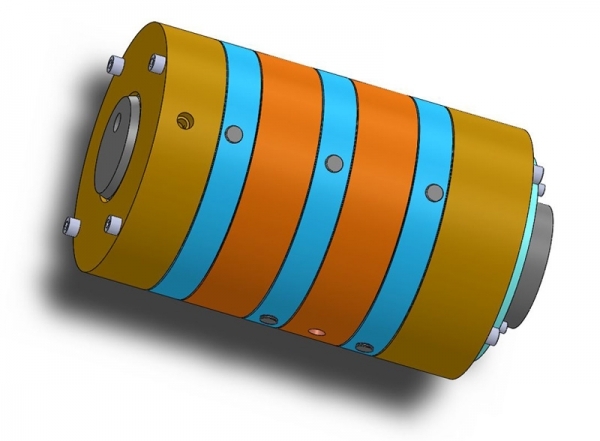 The stacked housings in this hydraulic swivel design are relatively simple to machine and are piloted together by axially short, bind-proof pilots that assure easy assembly. The stacked housing design eliminates the use of radial O-rings, which cause significant assembly difficulty, and are prone to failure in high-pressure service conditions. The middle image below shows the hydraulic circuits of the high-pressure swivel. Each high-pressure swivel seal is supported by a floating backup ring that is captured in position by the stacked housings. Anti-rotation pins are used to prevent the backup rings from rotating with the shaft. Each backup ring is guided by a close journal bearing-type fit with the shaft that also defines the extrusion gap clearance that the hydraulic swivel seals are exposed to. When in use, the cross-drilled hydraulic fluid passages communicate hydraulic pressure to the backside of each backup ring, providing the backup rings with axial force balance. The axial force balance leaves the backup rings free to float laterally to align themselves on the shaft, even in situations where a significant degree of shaft runout is present. Refer to Chapter E2 of our rotary shaft seal handbook to see an enlarged view of the hydraulic fluid passages, along with comprehensive instructions on how to design a high-pressure hydraulic swivel. 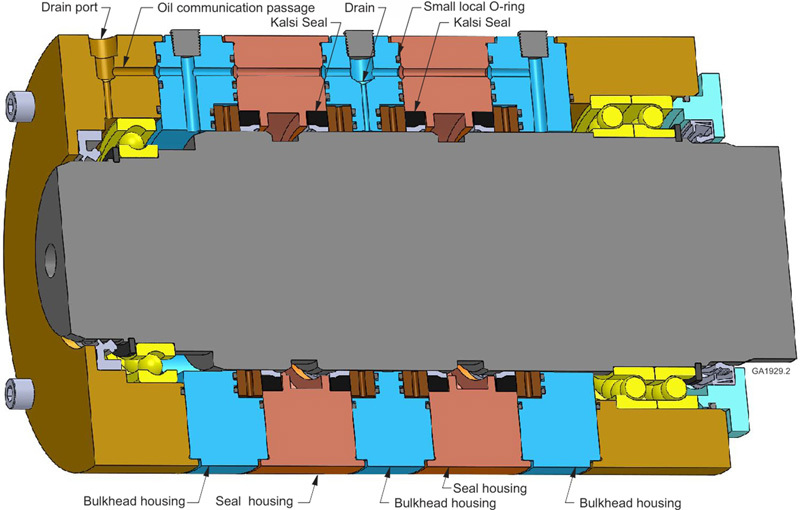 Finally, the right-hand image below shows an oil communication passage that provides communication between the sealed bearing regions. The oil communication passage also serves as a drain that accommodates the hydrodynamic pumping-related leakage of the Kalsi-brand hydraulic swivel seals. The leakage can be returned to the hydraulic fluid reservoir. If you are interested in learning more about specific design recommendations for high pressure hydraulic swivels, Kalsi Engineering provides detailed resources. Refer to Chapter E2 of our rotary shaft seal handbook to discover more about hydraulic swivels and our swivel seal designs. For hydraulic swivels in the 1,000 psi (6.89 MPa) pressure range, consider the BDRP™ seal, which was designed to seal hydraulic pressure acting in either axial direction. This feature allows three seals to define two hydraulic circuits. Floating backup rings are not required in this pressure range. Kalsi Engineering, Inc. is a leader in engineering services for the petrochemical, aerospace, manufacturing, and mining industries, providing both engineering consulting services and high-quality rotary seal solutions. Our patented rotary seals are the result of pioneering research in hydrodynamic lubrication, while our experience in the engineering field makes us a valuable resource for any engineering application. Whether you’re interested in our product lines or you need a consultant for your next engineering project, Kalsi Engineering can help you find the best solution for your application, even if it isn’t one of our in-house products. Trust Kalsi Engineering for quality products and advice. Contact Kalsi Engineering today for a quote, or to learn more about our hydraulic swivel seals, and our design recommendations for high-pressure hydraulic swivels. The pressure housing assembly of this high pressure hydraulic swivel consists of stacked housings that are retained together by axially oriented bolts. The rotary seals that define the hydraulic circuits of this high pressure swivel are supported by laterally floating backup rings that reduce extrusion gap clearance. The oil communication passage of this hydraulic swivel communicates lubricant between the sealed bearing regions, and collects rotary seal leakage.